Ok, got those two wires from the 4th gen plug connected. Still no fuel pump when I turn the key on though. After I crank and shut it off, I can hear the fuel pump whining, but still no start. Any ideas? Sigh .... amazing what happens when you plug in the wiring harness from the ECM to the engine bay ... Fuel pump problem solved. 1. Still no SES light when key is turned on. 2. "Check Gauges", "Low Oil", and "ABS Inop" lights stay on constantly now. Any ideas on those things? As for the gauges, it sounds like you have something wired wrong. You'll want to recheck everything. If you followed someone elses wiring you may not have the same color scheme. The best way to check to make sure you have the correct ses light wire is to run a voltage meter on suspect wires. Well, I didnt change anything and the SES light works fine now, must have had something to do with that ECM plug. I still have the extra idiot lights on the instrument cluster on. Basically, my 91 doesnt have things the 94 had such as ABS, low oil level sensor, etc. I was thinking if I ground the wires for those, they'll probably go away, but I'll just yank the bulbs out and go about my day. ok, anyone happen to have the wiring diagrams for a 93-97 Firebird headlight switch? Last edited by Slepewesel; 05-30-2006 at 10:04 PM. check out shoebox's site. Under "how to's" and then "schematics and wiring". For example, Has 95 camaro and firebird pin-outs for clusters. I would think all 93-02 firebird clusters have about the same pinouts. He has mostly wiring diagrams for 93-97 camaros/firebirds. Thanks Firebat, I came across that site before, quite helpful. One small glitch. took the car for its maiden voyage tonight with the new cluster and such. tach is off quite a bit. It came from a 94 Formula, but this thing is reading like 3500 rpms at 65 mph. Any ideas on that one? Sure it isn't a V6 tach? Search for "dakota digital". You'll have to get their converter box for the tachometer to read properly on the 4th gen gauges. The tach from a V6 and V8 both read improperly (jumpy) in my car with a 3.1 V6. I haven't got mine yet but I've heard from many other people that it fixed their problem. Unfortunately the converter is somewhere around $80. $80??? Damn ... ok, thanks guys. 45 ohm resistor will keep the ABS INOP light off. somewhere around that. not exact.whatever you can find. Eh, I just took the bulb out. But now for some reason, the "Brake" light is on. Parking brake is off, and I tested this thing quite a few times, worked jus fine before. I'm wondering if it has something to do with the brakelight switch itself? whta did you guys do with the 2 pink/black wires on the 4th gen plug????? Uh .. don thave my wiring right in front of me, but I think they both ran into the power from the fuse wire on the factory harness. they are 12v+ power IGN from the fuse box. so I run them into the orange wire? orange is CONSTANT power. pink is the color you are looking for on the 4th gen stuff. pink is power on the 4th gen cluster plug. pink-black stripe is 12v IGN power on the 3rd gen chassis harness. Ok I have 2 pink wires on my 4th gen plug. Do I tap them both into the pink/black on the thirdgen harness? shoot me your email and ill get you a pic over of the plug for the cluster that shows the pinout. pink is your hots, yes sir. have the same problem with my tach that you had also...2.8L v6 car, and my 4th gen guage cluster is out of a 96 v6 bird...When doing 65 mph, it read's approximately 4,000 RPM, at 4500 RPM i'm doing 70, and at 5000 rpm im doing 75 (as the officer informed me of)...I'm forced to use the stupid tach to give me speed however because i haven't done the VSS swap yet (lazy, and don't have time to break something...need that car) Wish i had done my swap more recently, so i could remember all those colors on the dash, but i've got a write up in my house somewhere...i'll have to see if i can come up with it. Heeeeeeeey FADED. Working on the HVAc controls now. I have a 91 Z28, and have 2 "extra" vacuum lines coming into the factory panel, pink and grey. The pink actually splits off and runs to the HVAC panel and also into the same spot as this rogue grey one. Any ideas on what to do with those? Also on the fan speed switch, the factory plug has 4 wires (Yel, Org, Blu) and then the brown one going to the Level switch. 4th gen fan speed switch has 5 wires (Yel, Org, Tan, blu) and a big green one going to the level switch. What should I do with the extra wire on the 4th gen panel? I'm thinking just wire it into the "High" speed setting on the 3rd gen plug, but I dont know what settings correspond to what wire color on the 4th gen. Any help? Last edited by Slepewesel; 06-16-2006 at 12:03 AM. the one where our's has the connector with 4 wires, i was told we should have to splice those wires that the connector will go right into the back inplace of the other connector from the 4th gen? but i'd like to know the rest also! from what year of S10 do I use for the cold/hot cable? Dunno, I'm planning on using the 4th gen cable. i spent about 5 hours making brackets for the 4th gen cable and i'm still not happy with it, but it works. Most of it was figuring out how stuff works. I'd rather get the s-10 cable. do you go about even making this bracket for the heating controls, i looked for info but people just show what they have done not how they did it. the back of the 00 camaro heater controls has more wiring then i have on my 86 trans am. im not sure what im using except there is one plug that came off of the old heater controls with 4 colors. people said replace it with the one on the 2000 camaro controls. but then i have this other connector with thick wires 6 of them colored, can anyone help? Hmm, that doesn't sound right. My fourth gen switch and the body wiring both had 5 wires... tan, blue, orange, yellow and brown. I just plugged my third gen harness into the 4th gen switch. There was no splicing required. I just know that the thick brown wire went to the thick brown wire on the vent select switch. The extra pink and gray vacuum tubes are for the heater control valve. When the temp select is all the way on cold the gray line should get vacuum from the pink line, which which diverts coolant. Everyone else has just capped off those two lines. I want my swap to work like it's supposed to, but I haven't tackled this yet. I have an idea though, but I'm not sure if it's going to work. It involves using part of the third gen controls and running those two lines to the hot/cold door. The S10 cable was a big misunderstanding. IT WILL NOT ALLOW YOUR 4TH GEN CONTROLS TO WORK WITH YOUR THIRD GEN HOT/COLD DOOR. The person that used an S10 cable was using controls from a different car, not a 4th gen.
ok so u plug the control from the thirdgen heater into the 4th gen not splicing, good. now the **** to change A/C, max A/c, etc there are big colored wires coming from behind, 6 of them, where do these go? 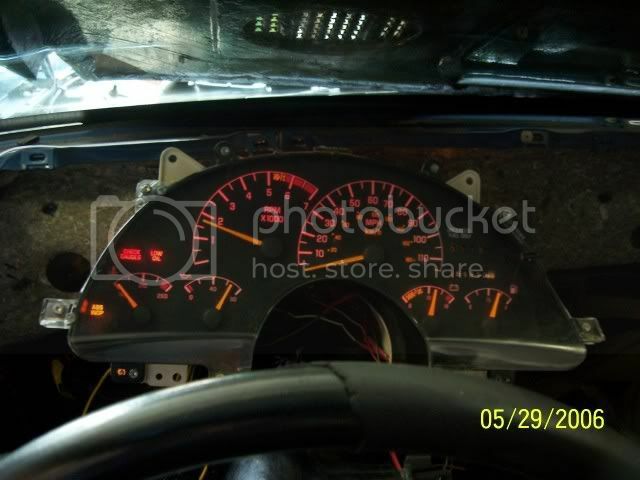 ok i got my cluster installed... Everything works but the speedo , its pegged at 150mph. The cluster came from a 1996 forumla lt1. Any ideas?? Nope, should work fine. Double check your connections and make sure you have the right wires run together. d:12 reads dark green and white for the 4thgen plug. I dont have the grounds bolted up I just kinda held them against steel nothing happend. I use wire 14 on the thirdgen harness. I still have a bunch of unused wires on the 3rd gen plug tho. Not 100% sur eon the T/A, but I dont think you should have any wires "left over" from the two 3rd gen cluster plugs. You will from the 4th gen plug, simply because a 4th gen has things a 3rd doesnt (coolant and oil level sensor, etc...). I think I ended up with like 3 wires on the 4th gen plug left over, but all of them from the 3rd gen went in. well I used a 86 diagram and were the wires were left over it said on the diagram someone posted "not used". not to forget my car is carbed so I will have extra wires left over such as choke ,etc. Ok, got the wiring worked out I think with the 4th gen plugs. My 91 only had 3 speed settings, "low, med, and high". The first "setting" was "Off". Anyway, on the vent thing ... my AC works, but when I switch it to just vent nothing happens. The doors are opening and closing as they should, but the blower motor switches off. Any ideas? Last edited by Slepewesel; 06-22-2006 at 05:42 PM. The blower shuts off on vent? Does it turn back on when you are on defrost? If so you probably have the wire for the blower and the wire for the AC hooked up backwards. Yep, turns back on when I go to defrost. I changed around the 2 wires to try that and immediately blew a fuse. Something is definately wired wrong. Do you have a multimeter? It's worth it's weight in gold for figuring out problems like this. Slepewesel, did you get your problem fixed? No I havent. Still waiting on a friend of mine to get me some wiring diagrams to make sure things are right. But what I dont get is, there are 2 wires to be connected on each harness. One way, the A/C and Defrost works fine, the other way, the fuse immediately blows when you turn it on. So I'm not real sure whats going on, but I do know time is scarce so i might play with it this week sometime. But what I dont get is, there are 2 wires to be connected on each harness. But there should be 5 wires on the body harness and 3 wires on the 4th gen switch. Sorry ... I mean on the vent selctor switch, there are 2 wires coming into the plug from the body harness. The third one goes over to the fan speed dswitch. How do you connect the wires for the 4th gen rear defrost switch for a thirdgen firebird? whats the reason for bypassing the timer, don't 4th gens have a timer too?